August 02, 2017 - Technology - PI (Physik Instrumente) Ltd.
Medical device company ITL Group specializes in the design, development and manufacture of life-saving medical technology, diagnostic devices and analytical instruments for a range of customers, from start-ups to well-established international companies. 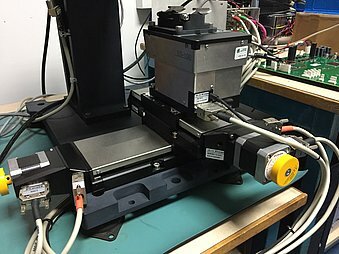 ITL product developers recently teamed up with fellow engineers at Physik Instrumente (PI) to integrate XYZ mechanisms in a prototype instrument, using off-the-shelf components, rather than designing from scratch. Martin Foxley, Project Manager at ITL, describes how a fruitful partnership with PI resulted in successful completion of the project within a tight timeframe. ITL was founded in 1977, offering worldwide medical device design, development and manufacture, from very early concepts aiming to attract venture capital funding, right through to manufacturing, and any stage in between. In ITL’s early years, the market was focused on large instruments that incorporated several processes, such as sampling, mixing, dispensing and shaking. More recently, however, there has been a paradigm shift towards point-of-care diagnostic instruments, making use of a whole spectrum of technologies – including luminometry, spectroscopy, fluorimetry, etc. – with the latest trend being DNA detection. Customers wanting to design a product typically come to ITL with a concept, and the R&D department’s electronic, firmware, mechanical software and systems design engineers flesh out a requirement specification, which could be a conviction kit or an engineering breadboard or prototype, and will sometimes lead to a pilot instrument, and into manufacturing. In this particular case, the client approached ITL with an open frame instrument design, requesting a technical audit that would lead to the development and eventual production of an automated fluorescence screening microscope that scans for DNA, a very high value specialized product for central diagnostic laboratories. ITL was tasked with designing the system, including the electronics, deciding on embedded processor boards, the optics and the mechanics, and pulling everything together into a final product. This involved a fair degree of redesigning around the principles of the original idea, and one key element was consolidation of the XYZ stage. The Z drive was already based on an excellent single Z mechanism from PI, and it made sense to approach the company about corresponding X and Y drives, preferably using an off-the-shelf component rather than having to design it from scratch. This would give a huge advantage of guaranteed accuracy and resolution down to the nanometre scale. The timescale of the project was also a real challenge, and using pre-existing mechanisms would help to save time, not only in design, but also in validation. The ITL and PI teams worked closely on what was required: the X and Y movements needed to accommodate the sample loading mechanism, which meant considerable travel away from the optics; it was key to fit them orthogonally – the X and Y drives were mounted within two arcseconds, and the Z mechanism was bolted on – so that the whole unit was finally supplied to ITL as a complete module. An integrated PCI card was also supplied, rather than a separate control unit, to control the positional accuracy and resolution. There were inevitably a few issues along the way but the two companies formed an excellent relationship and, with direct contact and assistance from PI engineers in Germany and the UK, everything was resolved. The overall result was a top-of-the-range XYZ positioning mechanism, as part of the final product, a flexible, 160-sample auto loading, research instrument now in manufacture.